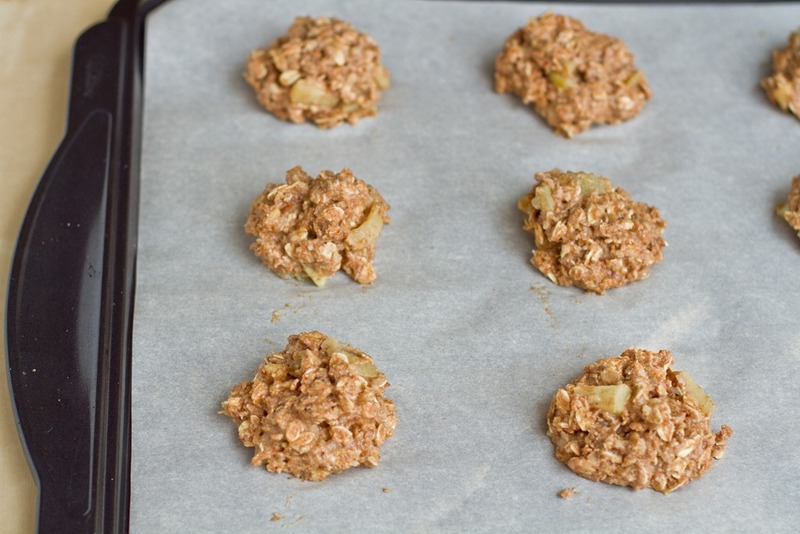 The other night as I was giving my Recipes page a makeover, I realized that I have a bit of a thing for creating healthy snack cookies. Healthy snack cookies bring me great joy. The other night, as I looked out my window to yet another blistery snow storm, I realized that I needed more joy in my life. Soft, and chewy with a mouth-watering Apple Pie flavour thanks to the big chunks of apple, walnut pieces, hint of cinnamon and nutmeg, and dash of fresh lemon juice. They are just like biting into a Muffin, so Eric promptly named them ‘Muffin Tops’, but don’t worry they are easy on the waistline! They don’t contain a lick of oil or vegan butter, but are still incredibly moist thanks to the cooked apple mixture and mashed banana. 1. Preheat oven to 350 and line a baking sheet with parchment paper or a non-stick mat. Set aside. Mix your flax egg together (1 tbsp ground flax + 3 tbsp water) in a bowl and set aside. 2. Peel two granny smith apples. Take 1 apple and finely grate it. 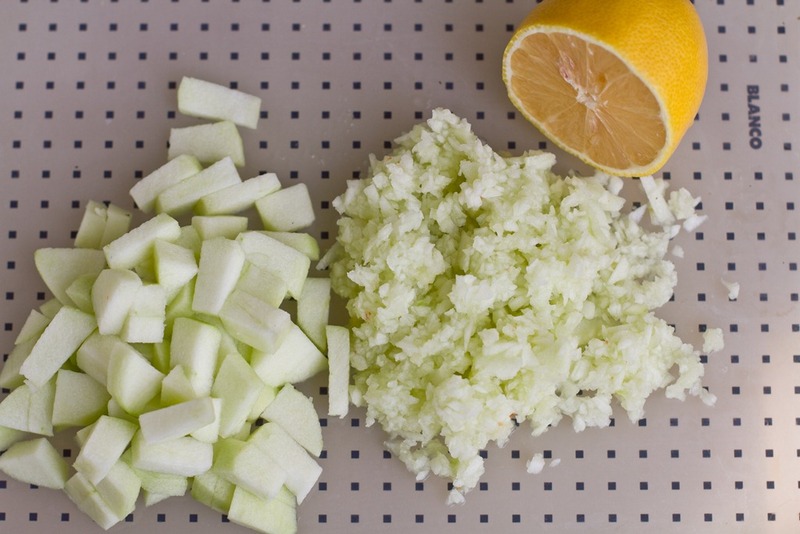 Now take the other peeled apple and chop it into 1 inch pieces. Add both to pot along with 1/4 cup pure maple syrup and 1 tbsp of fresh lemon juice. Stir. Cook over medium-low heat while you prepare the rest of the ingredients, for about 5-10 minutes. Watch closely and reduce heat as necessary so you don’t burn it. 3. 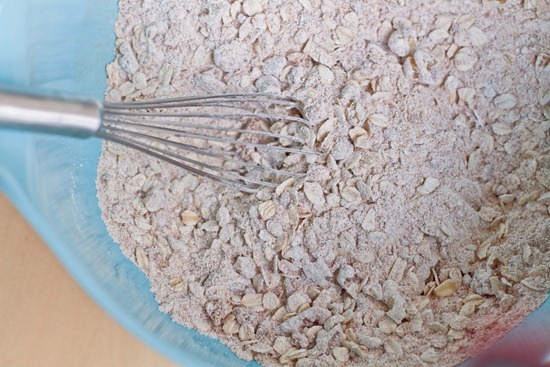 Mix dry ingredients in a large bowl and set aside. 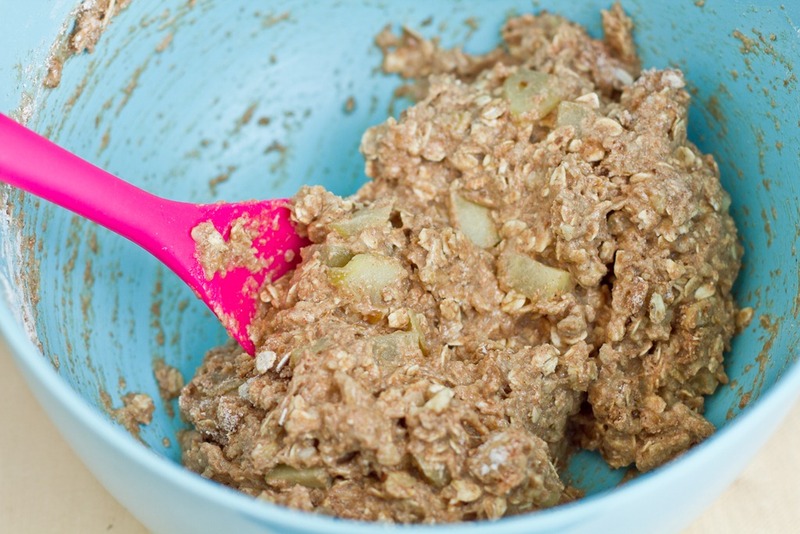 In another bowl, mix your wet ingredients: vanilla extract, almond milk, mashed banana, and gelled up flax egg. Whisk well. 4. 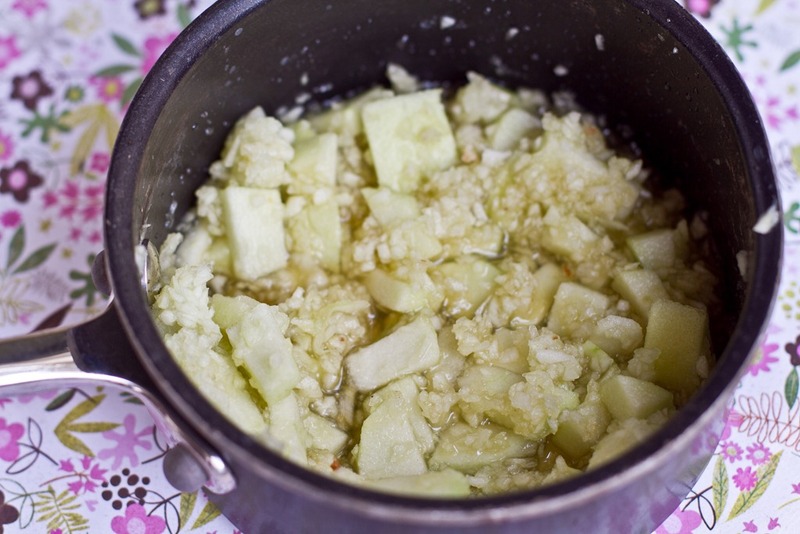 When apple mixture has cooked and softened for about 5-10 minutes, add it to the wet ingredients and stir well. Now pour the wet mixture onto the dry mixture and stir well. It will take a bit of elbow grease to get the mixture fully mixed, but not to worry. 5. Scoop 2 tbsp or a bit more for each Muffin top, leaving about 1.5-2 inches between each. Do not press the mixture flat. Bake for 14 minutes at 350F or until slightly golden in colour, but still soft. Please note that these cookies should be soft and do not get crisp or firm. They have the texture of a muffin. 6. Cool on pan for about 5 minutes before transferring to a cooling rack. Makes about 17 Muffin Tops. Nutritional info: (per cookie, makes 17): 105 kcals, 3 grams fat (0 sat fat), 19 grams carbs, 2 grams fibre, 8 grams sugar, 2 grams protein. First thing we do is mix the flax egg and set it aside to gel up. Now, peel your apples. Grate 1 of the apples and chop the other into 1 inch pieces. Add both apples,1 tbsp lemon juice, and 1/4 cup pure maple syrup into a pot, stir well, and heat on medium-low. 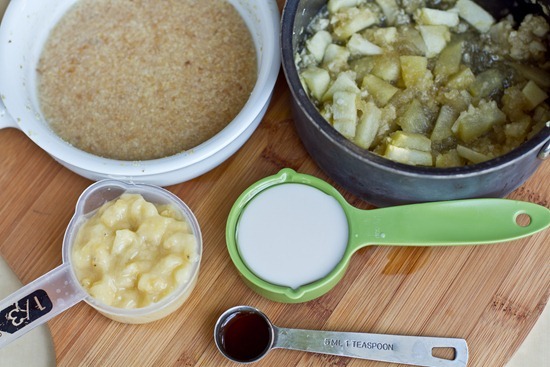 The reason I cooked the apples was to allow the maple and lemon flavours to soak into the apple, creating sweet, soft bites of apple, just like you’d find in an apple pie. The result was fantastic! It really didn’t add much time at all since you are preparing the other ingredients as they cook. Fun Fact: The mashed banana served as the oil-replacer in this recipe. After the apples have cooked on the stovetop for about 5-10 minutes, add them to the wet ingredients. 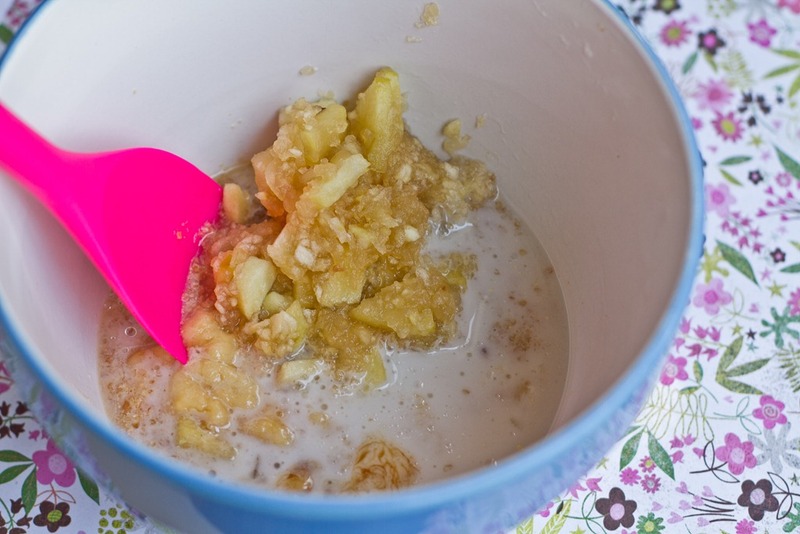 Stir all wet ingredients together, including this cooked apple mixture. Mix well. It will take a while for the mixture to come together, but not to worry! Stir until the flour is all mixed in. The batter will be very thick. Scoop 2 tbsp of the mixture onto the baking sheet for each cookie/muffin top. Bake for 14 minutes at 350F. 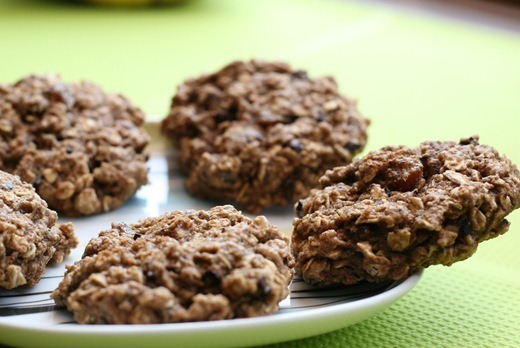 You will be left with an addicting snack cookie, that is like biting into a soft and chewy muffin top! My mother-in-law, friend Jessica, Eric, and I all gave these a big thumbs up and they went very fast. They are a great snack if you are looking for a pick-me-up that won’t give you a sugar crash. I’m off to do my first Tempo run of my Winter 2011 Half Marathon training plan. Any tips for Tempo runs? I’ll do a recap of what I did and let you know how it goes…Wish me luck! Mmmm… those look great!! Good luck with your training plan! I dreamt about those muffins after seeing the picture yesterday! Cannot wait to try these out! ahhh these are fabulous. my mom will LOVE THESE! 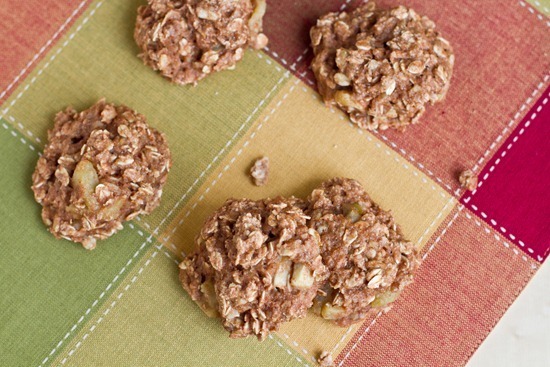 Looking at this post makes me realize how long it’s been since I’ve made a healthy snack cookie. I’ll definitely be looking over your pages later today for inspiration! Ang babe, those look amazing! Just love the step by step photos (as always). these look so good angela! i love healthy snacks, i went through a huge muffin phase a few years ago and baked/created nothing but healthy muffins. so glad I wrote all the recipes down because I love to visit them often :) I have so many apples I’m thinking I’ll probably add these to my list of things to make! These little guys are so cute! Gleee these look great! My ‘fetish’ is small healthy or sem-healty bites. Can be tiny cookies, balls, truffles, frozen PB? choc glob, etc. PS I made those pumpkin pie cookies ages ago and they were amazing! The rest I haven’t tried, weirdly enough. I love a “healthy” cookie recipe!! These sound delicious Ange! I love apple pie and I like your healthified version! I often do tempo runs and I find one of the best things to do to spur me along is to plan my playlists properly so that the beat of the music doesn’t slow down too much, because I’ll unknowingly drop my pace – it’s weird but the music really does affect the way I run! yum! 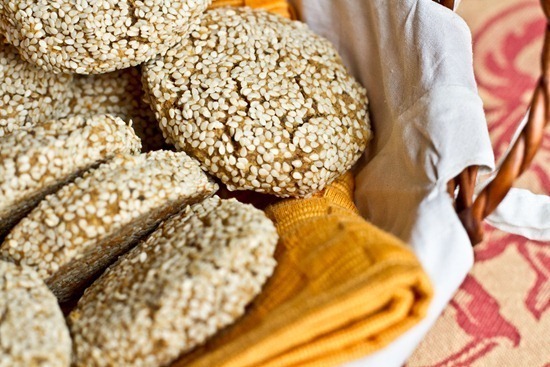 It’d be so easy to make these gluten free too! I must try! Have fun running this morning! YUM! I can’t wait to make these! mmm how I love healthy cookies!! I need to add these to the to bake list! 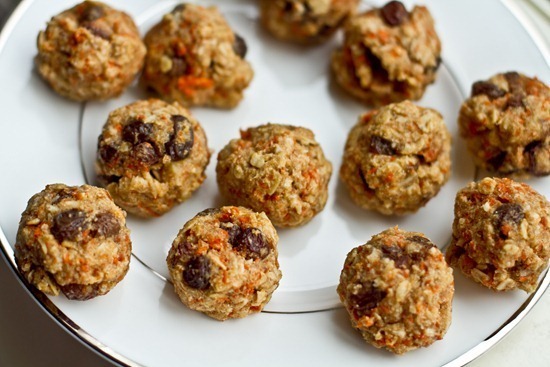 Mmmm…I love all your “snack cookies”….especially fond of the itty bitty carrot cake cookies! I just love the chunks of apple! I love the names you pick for the cookies almost as much as I love the recipes! Made your macaroni cheese last night and can’t believe how chessy it tastes even though there’s no cheese. Trouble is my husband loved it a bit too much and now wants me to make it again asap! I hate bananas, but this looks sooo good. Do you think they could be replaced with applesauce, or can you even taste them in there? I just love your site, Angela! You have the kind of creativity with healthy, satisfying food I wish I had! You’ve defintiely kept me in full-supply of good cookies this winter! Those Sesame Pumpkin cookies were my favorite. Apple may have to happen tomorrow… I have some ripe bananas begging to be used. I totally have a thing for small healthy cookies too. I am always looking for new ones, and I just got a bunch of bananas yesterday! 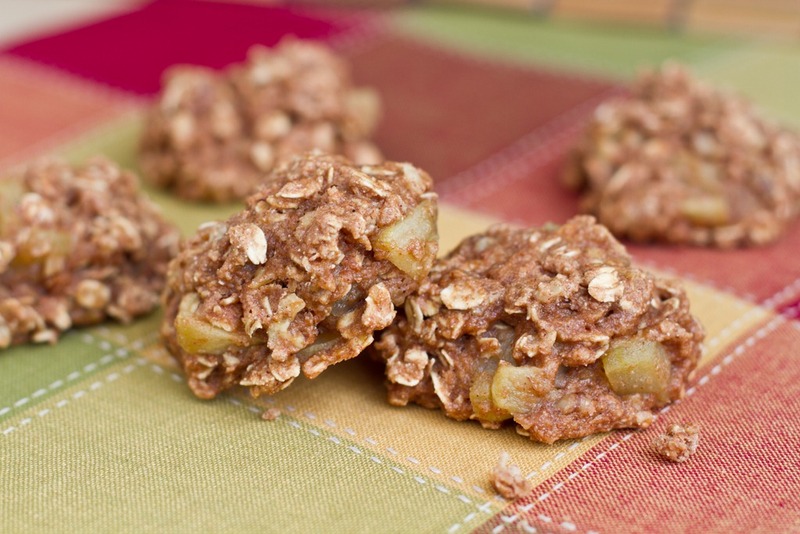 I am on a sugar free kick though…so I might have to try to make these without the sugar. I think I’m up for the challenge! Those no-bake almond butter chews are my fave after work snack right now. I have one when I get home so that while I cook dinner I’m not ravenous! These “muffin tops” look like they’d do the trick as well! Good luck with your tempo run today! That looka amazing! 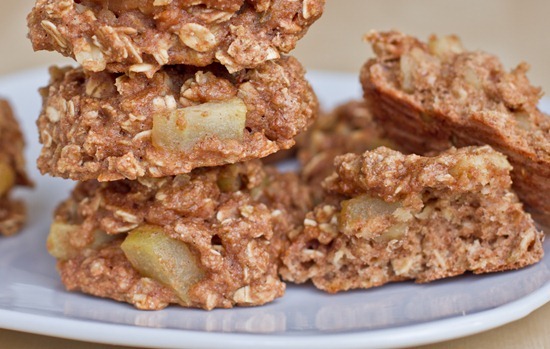 I never know what to do with my left over apples that are on their last days so this is a great recipe! Usually I just munch on them until I’m sick of them ahahahaha! Mmm… apple pie… These really look good. Another must try from you! Thank you for your continued recipe inspiration, you’re helping to open my eyes on healthy baking alternatives and super delicious, healthy food! Good luck with your half-marathon training! I love anything apple and pie related. :-) These look amazing. I wish I had the ingredients on hand right now! 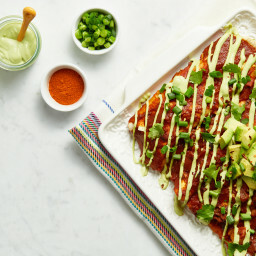 Where has this recipe been all my life? It looks WONDERFUL! Thanks! I am loving the sound of these! 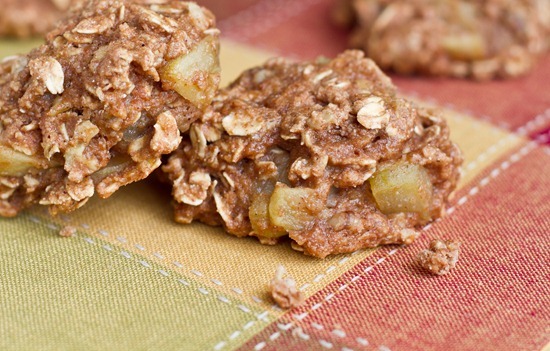 Your pictures have got my tummy growling :) Love that these are so good without being so bad! Wow– what a great, healthy snack! I love how portable they are too! And this is one of the MANY reasons I adore your blog. The healthy sweet snacks. Ah, yes! I like the two textures of the apple. I assume the grated helps old things together? And I love a “chunk” of fruit in my treats. Love that it’s so wholesome! Yes I would agree that it holds it together more and it also adds a ton of moisture too! I didn’t think I would love anything more than your pumpkin cookies – I think this might take the cake for a while. I’m planning on whipping up a batch pronto! 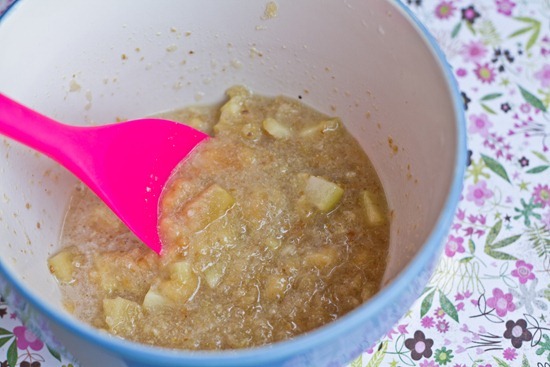 I have a spare apple that I couldn’t find a use for, and this recipe looks perfect! I’ll just half the recipe and make it gf. Yum! The pumpkin semase cookie looks good too, I’ll have to try that next week! Yummmmy! !…so easy and healthy to boot :) Most of us have these ingredients on hand too which makes it all that much better. Good luck with your run!! P.S. I still marvel at your vegan Thanksgiving dinner, recipes and wonderful pictures! 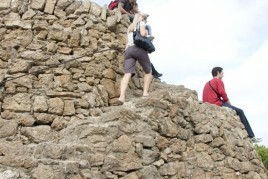 Truly a professional waiting to make the big leap. When’s that cookbook coming?! ;) Yah!! These muffin tops looks scrumptious! I love that they are oil-free, and the apple pie flavor sounds amazing! Could you sub honey for the maple syrup? I have all other ingredients on hand except the Maple syrup. Look yummo! I love how simple the ingredient list is! Sometimes vegan baking freaks me out with all the weird sub-ins. These look great! Looks so good especially since I have a weakness for apple pie. I love that they are called muffin tops. Definitely one of the most important things for me in cookies is the texture. 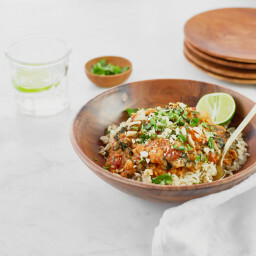 Another recipe that I’ll save and want to make asap! omg, when is your cookbook coming out? haha, I would totally buy it if you had one!!! 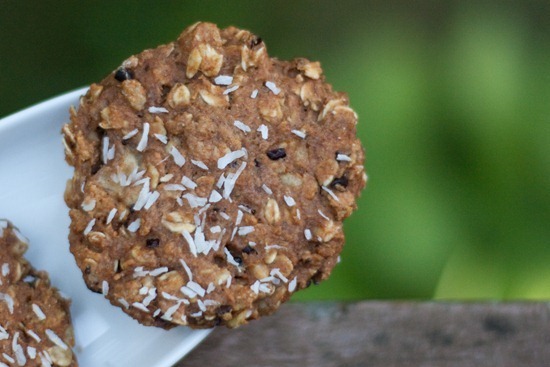 I love your healthy cookie recipes! They are the only things that compel me to stray from my trusted go-to super charge me cookies. The carrot cake cookies are my favorite! These new ones must be made immediately. Hehe I believe the bakery near my apt calls these things “muffies”! I love healthy snack cookies! These look delicious. My family is a big fan of apple pie so these would be great for them. These look great, Angela! I love muffin top anything! 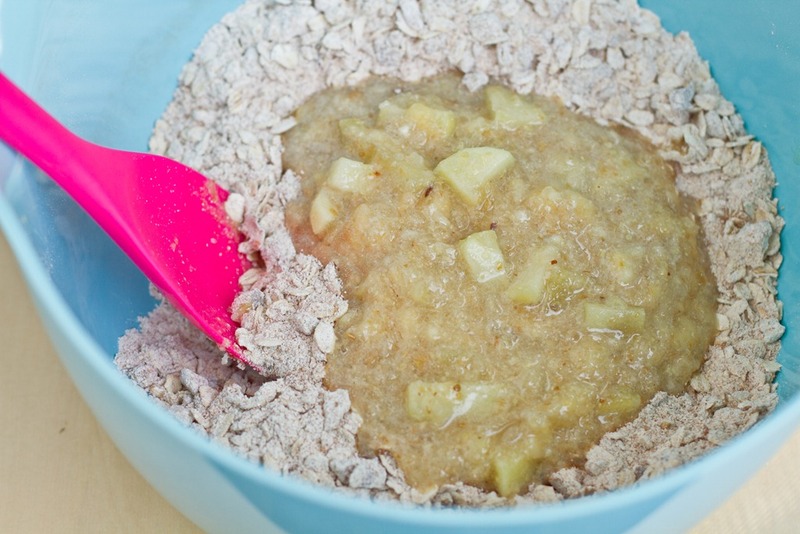 And I love apples, oats, brown sugar, so seriously…cannot go wrong! I’m allergic to bananas (something the developed fairly recently, and I only discovered after downing two of them after a marathon…ugh). Do you think unsweetened applesauce would work in place of the mashed banana? Muffin Tops remind me of Gilmore Girls! as always angela, these cookies look phenomenal. i don’t however have spelt flower, do you think i could use a combination of all purpose and whole wheat to get a similar result? Yes I think you could for sure! 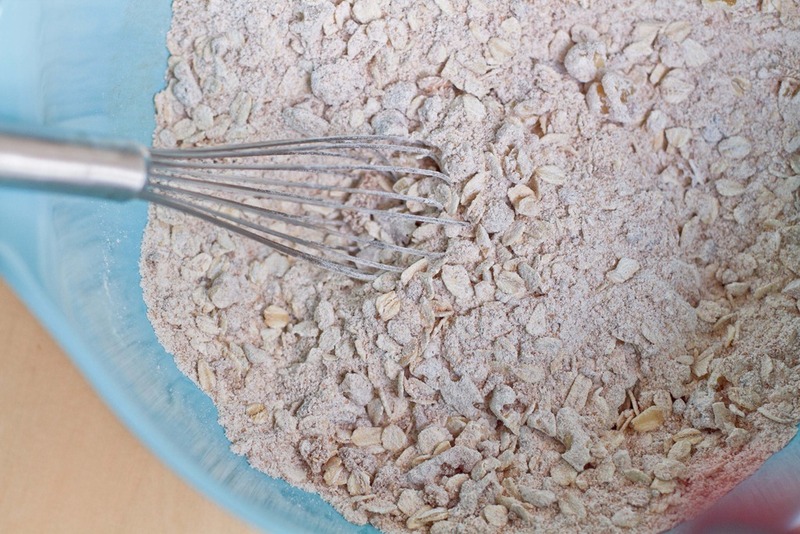 Although, I would try using a couple tablespoons LESS of whole wheat + white flour. I *think* the rule of thumb is 1 cup wheat flour = 1 cup + 2 tbsp of spelt flour. Although I could be wrong..
Just wow, another awesome creation from you! These look wonderful and I’d love to try them. Good luck with your training! And these have been added to my “must-bake” list. ;) They look amazing! I so wanna make these! 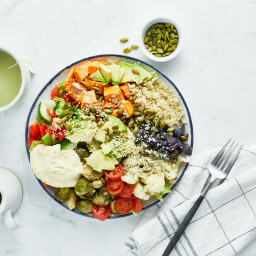 All of the ingredients are staples in my kitchen, and I’m guessing in most readers of this blog! Will I have the time to tonight? One never knows but way to go Angela! After seeing the carrot cake cookies, I HAD to make them today! Mine flattened out when baked, but they are SO DELICIOUS! Filling and healthy :) I can’t get enough of treats that are simple and small enough to pop into the mouth ;) I have been the queen of little treats lately! Anything apple owns my heart. I love healthy cookies. Can’t go wrong when it resembles a cookie. Now those are my kind of cookies! delicious and healthy! thanks for sharing these awesome recipes. I literally just printed out every single one of those recipes. They all look delicious! Plus they’re healthy :) Thanks!! Love that you call them muffin tops =] They look so moist and delicious!! I have the hardest time keeping bananas around long enough to use them in a recipe. I always eat them first. :P I think I should start keeping a stash of eating bananas and a separate stash of baking bananas. Thanks for sharing! We post all of the delicious recipes…with walnuts of course, and share them with all of our walnut loving friends. Anyone who loves the walnut, gets our love. 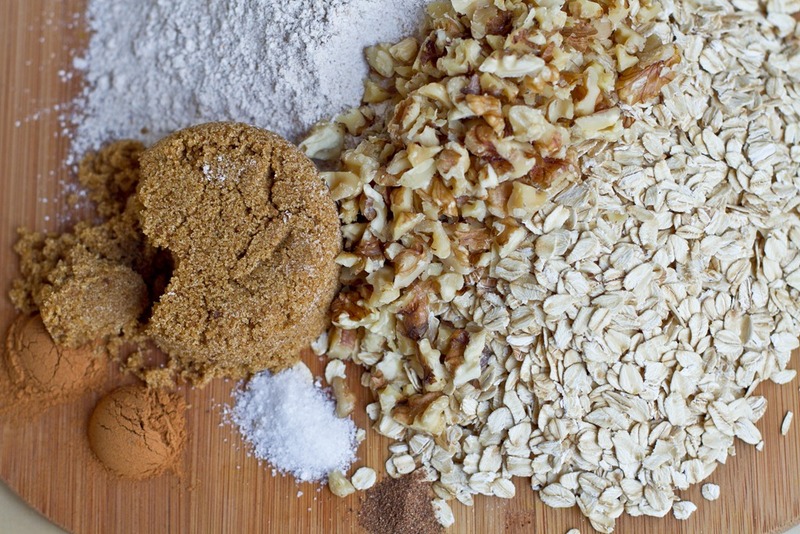 If you have a post or are baking something delicious with walnuts, please let us know! Happy Walnut Wednesday! That would be delicious over some greek yogurt with cinnamon! Holy crap, you had me at the freaking title of this post! When I can never decide if I want to make a muffin or a cookie, I dub it a “Mookie” ;)…better than “Cuffin” I think…? Apple crisp in muffin form; I love that! Lana..u are a sweetheart. Thanks so much! I knew I had to try to make these the minute I saw them. I had to change a couple of things so I could enjoy them too – made them gluten free, sugar free… but they were SO DELICIOUS! Holy moly. I’m in love. These are totally going to be a staple snack at our house. Thank you, thank you! Just made these and they’re DELICIOUS. Please come up with new flavor variations! Perhaps banana and pumpkin? Seriously, they are so good. SO excited to try this recipe! I’m hoping it’ll bring me back to the days of warm apple pies in the fall when it wasn’t so frigid outside! These look and sound so good! I really want to try them, but there’s one problem: I’m terribly allergic to bananas! :( Do you have any suggestions for other non-oil substitutions? Made these for a “Biggest Loser” group i am helping at work. OMG sooo good! Couldn’t believe all the flavor that was packed in that moist little bite! Thank you so much! 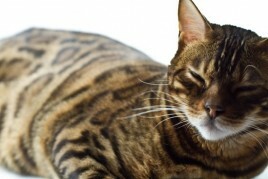 This is my first time at ur blog. I’m loving the details and presentation of all your recipes. Its fantastic …from every angle ! Just baked these, so yummy and cute. I could npt feel any banana in there, in case someone is wondering. They were not too sweet, but sweet enough. Yummy healthy snack. I only wonder if they have to be “sponge” like? Mine were not crusnchy, even though I baked them for 15 minutes. I don’t have spelt flour–do you think I could sub whole wheat flour? I just made these, they are delicious!! I halved the sugar, and they still taste great. Only issue is they never spread out at all, they stayed in a clump!! Any idea why? Do you think I can make this recipe without nuts? I am hoping to make a healthy fall recipe for a friend with a nut allergy this weekend. I am thinking of substituting coconut milk for the almond milk and leaving out the walnuts. Do you think this would turn out okay? Any suggestions to replace the walnuts? 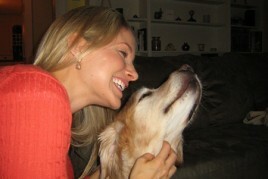 Previous post: Chin Rubs for Benny! Next post: Today I made..